God wants you to be a Republican. You may have heard news reports of Demoncrats who say they are Christians, but these are usually on unreliable channels, or on Fox news where they are exposed for the hypocrites that they are. 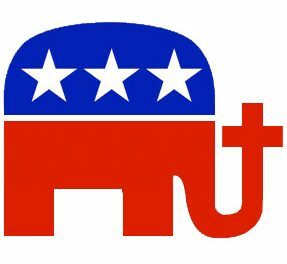 How do we know that God wants us to be Republican? The Bible tells us so. The Bible starts with the History of God and how he makes something from nothing which He might profit from: The Universe. His untaxed reward? Constant praise, millions of employees, and a dividend of souls. Next we have business assets – Ge:2:18: And the LORD God said, It is not good that the man should be alone; I will make him an help meet for him – God gave man assets – all the beasts. Next we have Eve Ge:2:20- 22 an employee. Great businesses always start by hiring an employee. God recognized the use of Law and Order and gave us the 10 Commandments enforced by an incorruptible priesthood directly responsible to Him. And to reinforce the Law, a strong and infallible God with the sanction of not a mere life sentence, but a sentence of eternal torture! There will be those among you who have not read your Bible –you may be deluded liberals with an “interpretation” – God’s Word needs no “interpretation”:His Words stand before you in burnished Gold. These milquetoast Demoncrats think they know better than God: They call upon God to change His mind… Jesus is God. Was Jesus’s Ministry on Earth really a cry for Hillary Clinton come forth as a prophet and save us all? Or was its message a little clearer? Re:19:15: And out of his [Jesus’s] mouth goeth a sharp sword, that with it he should smite the nations: and he shall rule them with a rod of iron: and he treadeth the winepress of the fierceness and wrath of Almighty God. Re:19:21: And the remnant were slain with the sword of him that sat upon the horse, which sword proceeded out of his mouth: and all the fowls were filled with their flesh. We cannot disapprove of any of this – it would be blasphemy.We cannot alter the facts: they are before us! We must approve and do our best to avoid being among the slaughtered. And yet there are “RINOs”, doves, peacemakers, compromisers! One cannot compromise with sin! We must work to bring God’s Kingdom on Earth.